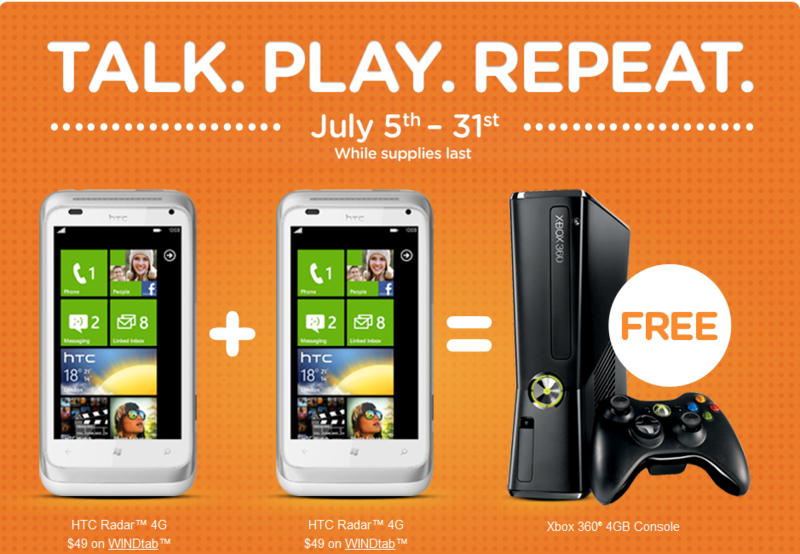 Ending on July 31st, and while supplies last, if you purchase two HTC Radar 4G Windows Phones through WIND Mobile you will receive a free Xbox 360 4GB console. Read on for the details on this great promotion from WIND Mobile. Here is how this promotion works: You purchase two HTC Radar 4G Windows Phones for $49 each on WINDtab, and you will receive a free Xbox 360 4GB console (while supplies last). The two Radar purchases must each be accompanied with the WIND Mobile $40 unlimited Canada-wide talk, text and data plan. The Xbox 360 4GB console currently has a price value of about $129. The Xbox 360 console will ship to customers 4-6 weeks after the promotion ends. This is a great deal, considering the HTC Radar is one of the few, and great, 4G Windows Phones that exist. Visit the WIND Mobile Xbox 360 Giveaway promotional page to get started on this offer.